Do you love the idea of open-air thrills when you hit the road? Are you unsure about the look and feel of a soft-top convertible? 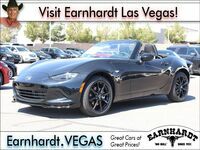 Mazda has got you covered with the 2018 Mazda MX-5 Miata RF in Las Vegas, NV. 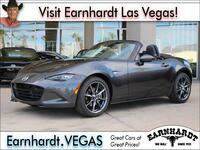 An athletic, affordable hardtop convertible, the Mazda MX-5 Miata RF is a fan favorite at Earnhardt Mazda Las Vegas. Learn more about this exciting, power-packed Mazda sports car today! Drivers who opt for the 2018 Mazda MX-5 Miata RF this summer will enjoy a world-class ride in an athletic hardtop convertible. When you choose the Mazda MX-5 Miata RF, you will have a choice of two premium grades – Club and Grand Touring – that will start at $31,910. A sleek design, performance-tuned features, a wealth of next-generation technology and an athletic personality promise to make the Mazda MX-5 Miata RF stand out from the automotive masses. What Are the 2018 Mazda MX-5 Miata RF Features and Specs? Tailor-made for the driver who enjoys the thrill of getting behind the wheel, the 2018 Mazda MX-5 Miata RF in Las Vegas, NV will deliver a memorable experience at every turn. Under the hood, the Mazda MX-5 Miata RF features a 155-horsepower 2.0-liter SKYACTIV®-G four-cylinder engine that gets paired with your choice of a six-speed SKYACTIV®-MT manual transmission or a six-speed Sport automatic transmission. When equipped with the automatic gearbox, the Mazda MX-5 Miata RF will earn 26 mpg in the city and 35 mpg on the highway. To upgrade the performance attributes of the rear-wheel drive Mazda MX-5 Miata RF, engineers have added a performance-tuned suspension, Bilstein shock absorbers, a sport-tuned exhaust system and a limited-slip differential. With the addition of the Brembo/BBS Package, you can add upgraded Brembo brakes, lightweight BBS wheels, aerodynamic body elements and heated black leather seats. Mazda MX-5 Miata RF Grand Touring editions add an influx of luxury elements that include Nappa leather interior, heated seats, navigation, advanced driving systems, automatic climate control and much more. A highlight of the Mazda MX-5 Miata RF is the power convertible hardtop that provides the perfect combination of roadster style and open-air thrills. At the flick of a switch, you can raise or lower the power-folding hardtop in just 13 seconds. Inside the Mazda Miata RF cockpit, you will enjoy a standard 7-inch MAZDA CONNECT™ infotainment system with touchscreen capabilities, Bluetooth, a Bose® nine-speaker sound system and much more. Additional highlights include a 4.6-inch color LCD digital display, LED headlights, keyless entry and push-button start.